The Port of Longview’s Board of Commis- sioners has unanimously approved the 2018 Budget, which includes significant invest- ments in the expansion of the port’s Industrial Rail Corridor (IRC) and infra- structure development at Barlow Point. These investments capitalize on previous year’s momentum of multi-year projects that will bring increased economic growth to our industry and new opportunities for customers. Connecting mainline rail with the port, the IRC plays a key role in port operations. The expansion project includes adding seven additional tracks to the system, bringing the IRC to a total of nine tracks. This additional capacity will allow trains to move simultaneously, add storage for unit trains on sidings and accommodate the growing length of trains. In 2018, the port plans to invest $952,000 towards the planning and engineering of this project. In addition to the IRC expansion, the port has earmarked $300,000 towards the planning of a new entrance at Barlow Point, a 280+ acre parcel available for develop- ment. Directly on the deep-draught navigation channel of the Columbia River, Barlow Point holds incredible potential for business opportunities in the Pacific Northwest. Overall, the port’s 2018 General Fund Operating Budget is $31.1 million and the Capital Projects Budget is set at $5.1 million. 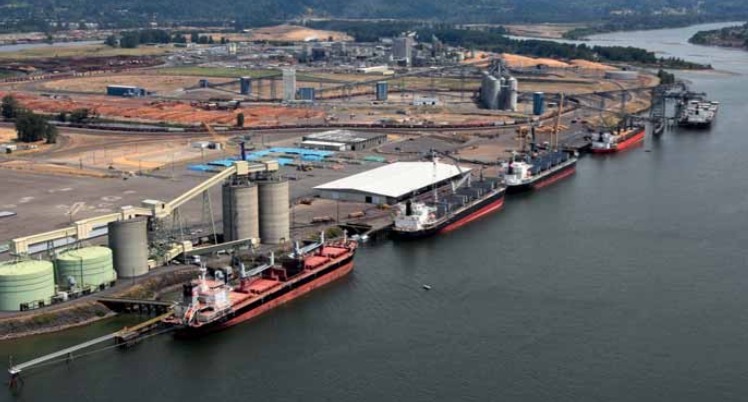 The Port of Longview is the first full- service operating port with strategic transportation connections on the deep- draught Columbia River shipping channel in southwest Washington State. The port is located just 66 river miles from the Pacific Ocean, 120 driving miles from Seattle, Washington, and 40 driving miles from Portland, Oregon. Port facilities include eight marine terminals and waterfront industrial property with direct connections to main-line rail and interstate highway. Cargo handling specialties include bulk cargoes and breakbulk commodities.